WHEN A FILM combines exotic locales and hungry fish, you get fly fishing tourism. Weave in a carefully cultivated soundtrack, and it becomes entertainment. Examine not just angling culture, but that of the destinations, and you have documentary. Roll the story with superb cinematography and it borders on art. Clearly these people hadn’t seen this type of activity going on before. You’ve got, you know, all this gear, you’ve traveled all this way to go over here, you’re going to fish. Of course the ultimate goal is to keep the fish. And when they release that fish the first time, these people were shocked. I think they were more blown away by that than the fact two Americans in funny looking outfits were actually in the water, fly-fishing. Combine all factors, while giving viewers a compelling reason to toss their smartphones in the can (after calling their friends to find out who’s pulling shuttle duty, of course)… and you have the latest production from Confluence Films, “Connect.” It’s at once purposeful, beautiful, and an encore performance. Jim Klug, Chris Patterson, and the rest of the Confluence Films crew have a job—provide a window into a world few of us will ever see, let alone fish. The end goal: leave you wanting to go on a fishing trip the moment their 90 minutes is up. The film does that, and then some. In classic Confluence fashion, “Connect” points the way to great fishing, while also giving the spectator reasons to be there that go far beyond rod and reel. 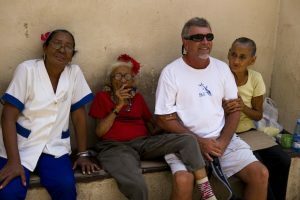 One recurring theme, conservation, is sold not just as David v. Goliath, but as a necessity intertwined in the lifestyle of the guides, outfitters, and local population, all of whom view catch and release fly fishing as integral to their livelihoods. The narrative convinces you that the stars of the show depend on the sport, not just for tips they might earn as guides or even the fame they might garner from being on the silver screen, but to maintain now lifelong friendships developed specifically because of it. 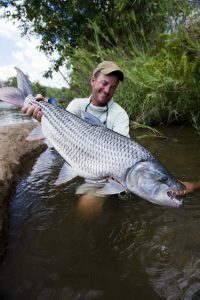 Meanwhile, the fly fishing camera work is pushed to its limits—whether panning a pristine Japanese mountain stream from high above, chasing a just-released tarpon across a Cuban flat, or staring a tigerfish in the teeth, you are left asking “how did they do that?” while simultaneously wondering who was crazy enough to dive into a Tanzanian river. Yes, the underwater footage beats all, but there is plenty of topside action too—targeting permit as they bob and weave behind stingrays on white sand flats, the pike of the Yukon drainage pummeling poppers from every angle imaginable, and seemingly endless shots of the wildlife in the Yellowstone backcountry. Spend too much time perfecting the writing, editing, and sound, and you could wind up with a bore. Thankfully, Confluence’s previous flicks pitch the idea that “we fly-fish because it’s fun,” and the concept is not lost with “Connect“ either. Rods double over, and reels scream. Anglers dance on the bows of boats, and guides mock their apparel choices. There are more than enough smiles, because there is plenty of catching, and quite a few laughs as well, thanks to a (very) lucky cast of characters. I do just like to wander off by myself even in a guided situation because it’s nice just to have that time alone in a place. And once you get the hang of it, these guides are great, they’ll take you to the spot and point you in the right direction and show you the flies. Then you can just go and fish on your own a little bit. It’s pretty straightforward, pretty easy, and the fish are aggressive. “Drift” and “Rise,” the first two films out of Bozeman, were released in autumn of 2008 and 2009, respectively. “Connect” took twice as long to assemble, and it shows in every aspect (including the massive quantities of beer and brats served up before the premier). Most of the show’s angler-cast joined the party, travelling from as far away as Tokyo to see the final product for the first time. They act like they are part of a family, which they are. If it all seems to good to be true, then it probably is. The film is sort of like Confluence’s encore performance, at least in the genre of “adventure” video. The film-maker now has blueprints on productions outside the travel/multi-segment genre, so those that haven’t yet been there and done that (or already have plans to) might have a longer wait for the next show. But no matter—while you gaze at the screen, you’ll be forced to ask yourself if you are, right that moment, living the proverbial dream. Fortunately, you’ve now got “Connect” to answer that question for you.